One of the wonderful things I've been introduced to over the past year are cleansing butters and oils. I had never considered using these types of products to cleanse my face because I have oily to combo skin. My first inclination was why would I want to add oil to my already oily skin? I have learned the products I used in the past to strip oil were only making it worse. Let me tell you, ever since I've been cleansing my skin with oils or butters, my skin has been less oily. I'd say my skin has shifted from oily-combo to combo-normal! 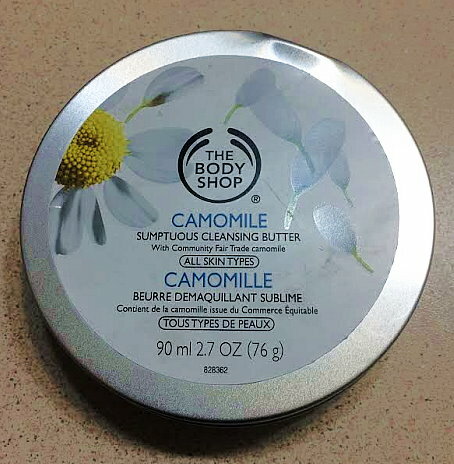 This cleansing butter from The Body Shop has been a great find for me. Product Description: This cleanser is an indulgent make-up remover for the whole face. It gently and efficiently melts away make-up and impurities, leaving skin feeling clean, refreshed and pampered. This is what the product looks like inside the tin. I've had this for around two and half months. It's clear from this image this will last me a few more months! Scent: This a very faint and pleasant camomile floral scent. The scent is not overpowering, strong, or perfumey at all. Application: You absolutely have to apply this to your skin with clean and DRY hands. I always clean and dry my hands first before using this. Your face must be absolutely dry too! The amount you use I think is dependent on how much makeup you have on your face. I think it's always better to overestimate than under. If you do not use enough product it will not remove all of your make up properly. I use about a quarter size maybe teensy bit over a quarter size amount. 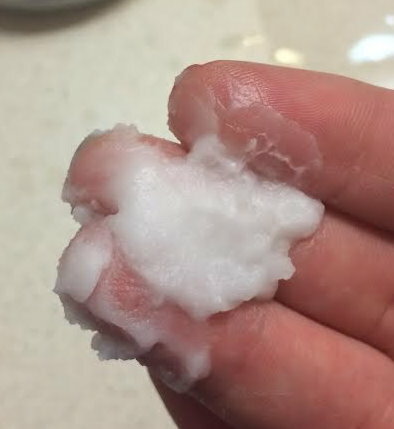 I then rub this between my hands, and it instantly melts into an oil. I rub this onto my entire face, while paying extra attention to my eye area for a good minute. 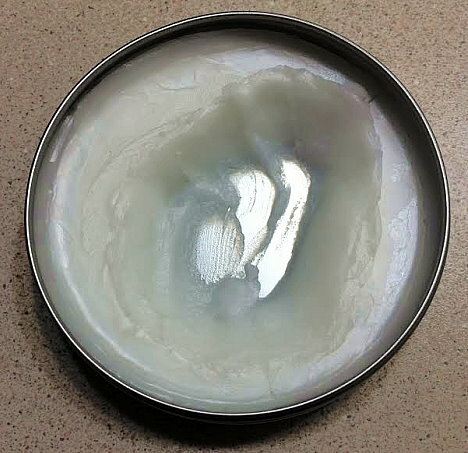 This melts your makeup away and it's a process you can watch. This does not sting or burn your eyes at all. I love that about this because I can really see it removing my eye makeup. I don't have to guess. I know when it's gone! Removal: I personally remove this just with water. I get my hands wet and start working the water into my face. This causes the product to turn into a slight frothy and milky consistency on the skin. Once you reach that consistency I put my face over the sink and wash the rest off using more water from the faucet. Viola! You could also remove this with a washcloth if you wish. Skin Feel: This leaves me skin feeling very soft and hydrated. I do not detect any greasy or oiliness after using this cleansing butter. Results: This removes all of my makeup very well. It's gentle and easy to use. I will say that in the beginning I did not use enough product, and I was left with some mascara residue. As I mentioned before it's best to overestimate how much you need than underestimate. That being said, you can see from my tin now, I still have months of product left, so I don't feel I'm using up the product quickly. Price: This is $16 at The Body Shop, however, The Body Shop is always running some sort of B3G3, B2G1, X% off sale, so you really don't have to pay full price! Overall: I really like this cleansing butter. I think it does its job. It's gentle, removes all of my makeup, and I like how my skin feels afterwards. Sounds great Steph! I can not imagine going back to using something not oil/butter like to remove my make-up - it works too darn good! My favorite is an oil I buy on eBay, it's Japanese I think and quite inexpensive :). Nice review on this. It sounds lovely!